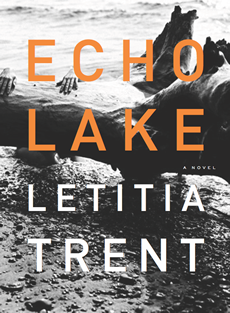 Echo Lake, the new novel by Letitia Trent, concerns the time spent by a mother and daughter in the community of Heartshorne, Oklahoma. The mother, Connie, fled the town as a teenager for initially undisclosed reasons. It is to this same town that Emily, her daughter, moves at the start of the novel, having just inherited a small house there. Soon after she arrives, she learns that its prior owner, a distant relative, was murdered. She then begins the process of uncovering her family’s past, exhuming secrets that her mother took stubbornly to her grave. In the most engaging stretch of the novel, Emily scours old newspapers and the memories of elder locals for the truth of what drove Connie away from Heartshorne. Patterned together with this is the narrative of several days Connie went missing as a teenager. When she turned up, Emily learns, she refused to tell what happened to her, but we, the audience, are given this privileged information as we see Connie stumble into peril and try to find her way out of it. Once the novel begins this slow revelation, and we spend more time with Connie, the two narratives unfold in parallel with a rhythm that works very well. The novel takes its time finding this rhythm. For its sizable first part, we follow Emily as she catches her boyfriend cheating, learns of her inheritance, and leaves an empty life in Columbus, Ohio in order to go to Heartshorne and inhabit the house that now belongs to her. It seems that Emily is not motivated to do these things so much as she is compelled to do them; and the novel is rife with characters who do things because their hands are being somehow forced. In some cases, it is family history, or the town of Heartshorne, that does the forcing, as with Connie’s family’s swift departure in the wake of her brief disappearance and return. They leave less because they want to than as a result of the wary alienation of the other locals. The nearby Echo Lake also inspires certain actions, some of them gruesome. Early on, we see a murder committed on its shore, on a whim. It is understood that this act and others are brought about by the lake’s influence, or that the lake is a convenient, if unlikely, scapegoat for them. Echo Lake itself is perhaps the most memorable aspect of Echo Lake; Trent builds it up to be a truly eerie setting, a body of sickly water that is as haunting as it is haunted, where one cannot go swimming without risk of injury, thanks to the debris that lies just under the surface, and the fumes that pour out of it at night. The lake has a compelling enough presence in the novel that I wished more time were spent with it than with other elements of the book, such as Jonathan, to whom Emily goes for a tarot card reading and who emerges as a love interest. Jonathan is an essential part of the novel, for he represents one avenue by which Emily could join the Heartshorne community; soon after they meet, she envisions their future together there vividly, and not necessarily because she wants it. But his multiple tarot card readings slow the action down, in a novel that takes its time as it is. On page 266, Emily asks Jonathan to attend a church meeting with her. She asks him to go again on page 272, after he has already agreed to accompany her and has given her another tarot reading. There is no rule that says that characters must leave a place within six pages of agreeing to do so, but the delay is enough to try one’s patience, and it should not take so long for young people with no children to leave the house. This sort of thing distracts from aspects of the novel that are much more compelling, such as Connie’s story, which includes a brief captivity, and a dangerous intimacy that develops too swiftly to be truly convincing; more time might have been spent letting it come about at a slower pace, at the expense of other elements. The concern that emerges from the novel perhaps most successfully is with the life of a small town, and the ways in which communities decide the fates of individuals. One character justifies to Emily the provincial, extralegal justice that is often carried out in Heartshorne, saying, “It seems almost wrong to come into a place like Heartshorne and tell people who they can and can’t kill. You sign an agreement if you’re born here—” Emily interrupts, “You can’t sign agreements when you’re born…You don’t agree to being born at all.” Trent has worked this observation into the novel deftly, and there is a fruitful, ongoing concern throughout with the price one pays for living among other people, at least when one does it near a menacing body of water. Robert Long Foreman is from Wheeling, West Virginia. His fiction and nonfiction have appeared most recently in Hobart, Fourth Genre, the 2014 Pushcart Anthology, and Another Chicago Magazine. He teaches creative writing and literature at Rhode Island College, and you can find him on Twitter here.